Tricia Ballad is a writer, author and project geek. She has written several books including two novels, teaches classes on goal setting and project planning for writers, and loves to cook in her spare time. She is living proof that you can earn a living with a degree in creative writing. Thick, rich brownies are a classic treat. If you want to take your brownies over the top by making them even thicker, there are a few tricks you can use. Keep portion size in mind, and consider cutting thick brownies into smaller pieces than you otherwise would. A 3- or 4-inch-square brownie that is as thick as it is wide may be too much chocolate, even for the most devoted brownie connoisseur. Most brownie recipes instruct you to bake in a 13- by 9- by 2-inch pan. Brownies baked in this type of pan usually rise to about 1 inch high. You can substitute a smaller 9- by 9- by 2-inch pan or 8- by 8- by 2-inch pan to increase the height to which your brownies will rise. This takes advantage of simple physics. The larger ban has 117 square inches of space for the batter to spread. The smaller pans have only 81 or 64 square inches of space, giving the batter less space to spread. You will need to lower the temperature of your oven to 325 degrees Fahrenheit and increase the bake time by 10 minutes to cook the thicker brownies all the way through. Insert a toothpick into the center of the brownies to check for doneness. If the toothpick comes out clean, the brownies are done. Brownie recipes tend to fall into two categories: fudgy and cakey. 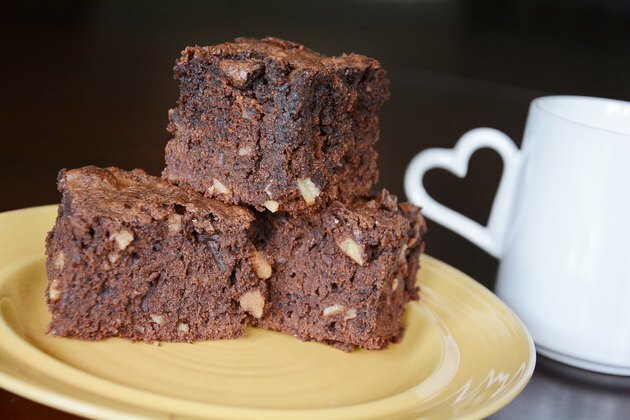 Fudgy brownies are dense, and tend to be smaller than cakey brownies. Brownies made in a cakey style are fluffier, which makes them taller. If you want a brownie that rises as high as possible, look for a cake-style recipe. You'll recognize it by the proportions of flour and liquid. 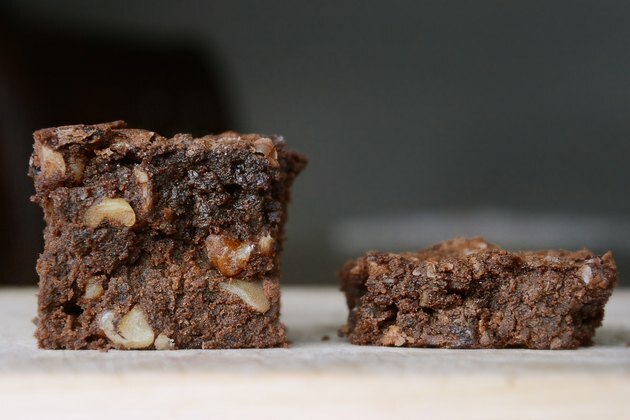 A cakey brownie recipe will call for more flour and milk than a fudgy one. Nuts, marshmallows and chocolate chips take up space, increasing the overall volume of the batter. A brownie baked with these additions will be thicker than the same batter baked in the same pan without them. 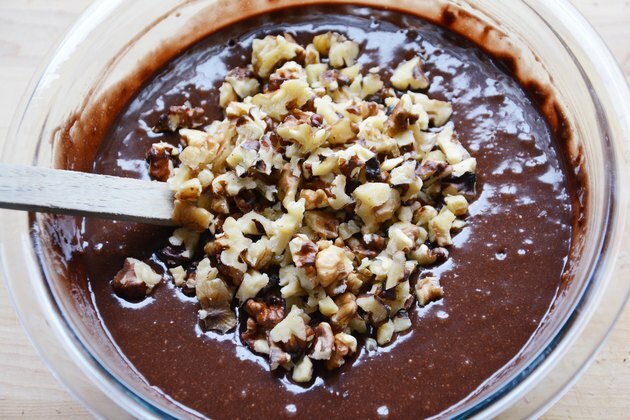 If you want to add drama, pour one-half of the brownie batter into the pan, then top with a layer of additions. Cover this with the remaining brownie batter. The finished brownies will have a ribbon of nuts, chocolate or marshmallows in the center. Brownies have enough structure to support your most creative ideas. 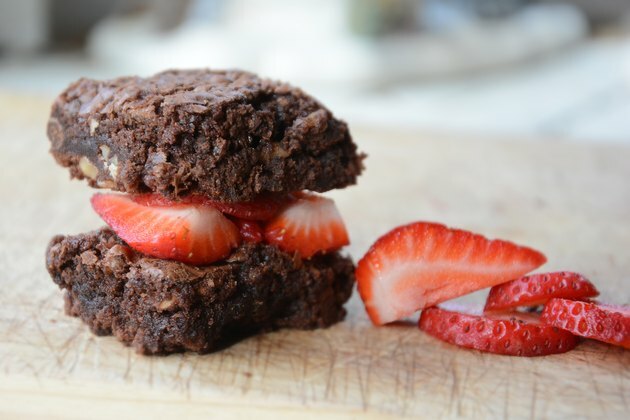 Sandwich two brownies together with your favorite frosting or fruit filling to create a double-thick brownie. 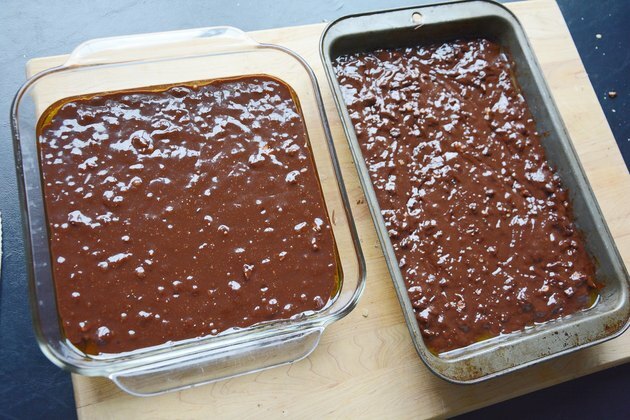 Can You Put Olive Oil in Brownies Instead of Vegetable Oil & Will It Still Taste the Same?